Our options trading course is structured as a one-on-one mentoring or a small group mentoring program. It spans a minimum of 15 weeks and is comprised of weekly live online lessons which cover theory and practical exercises. There are 10 theoretical teaching modules to build all the knowledge you need. To complement the theory there are 5 lessons which deal with practical exercises. Modules and exercises are presented in live webcasts to small groups of 2 to 5 people. You will receive the Options Mentoring hard cover course manual. You will receive OptionVue 7 software enabled for 3 months, including product training and support. The following are the 10 theoretical teaching modules contained in Options Mentoring. Every week we will schedule a one hour lesson to examine one or two of these modules. The modules are followed by 5 hours of practical exercises to consolidate your knowledge and demonstrate that you are ready to trade in real time. This is where we look at the “Nuts & Bolts” of options. All the theory required in order to understand the concepts and analysis to come. You will be introduced to what if analysis and understand profit and loss graphs the Greeks and more. Bollinger Bands, Moving Averages, Fibonacci Ratios and the Choppiness Index are all essential tools which can be used to implement a successful trading plan. Discover the power of options analysis software. We will learn to use OptionVue 7 to find trades and select the most profitable opportunities. Understanding the impact of implied volatility is the corner stone of finding trades and implementing the correct strategy. Understand how to define expensive and inexpensive options for buying and writing. Watching an entry point evolve is both a science and an art form. We will show in detail what defines a high quality entry point and how we time our entry for a period of fast price action. Watching an exit point evolve is both a science and an art form. We will show in detail what defines a high quality exit point and how to know when to take profits and or hedge a profitable options trade. Identifying the primary trend of the overall market becomes the starting point before seeking out individual trades. This section is about developing a broad overview of the market using the market Index. Both S&P 500 and S&P/ASX 200 will be examined. How do we find a group of trades suitable for analysis? See how to filter the market using the volatility of price to develop a high quality watch list. We started with call and put options in Module one now we progress to spread trading explaining how to combine short and long options into strategies called credit and debit spreads, for bull or bear markets. Directional trading is only one side of the options story. Knowing when to implement non directional trade and select the correct strategy will be addressed in this module. Trade management is the key to long term successful trading. Knowing how much to risk as a percentage of your account and understanding what you should do as a trade progresses is the key to maximising the profitability of every trade. I am offering a FREE no obligation phone consultation for those interested in finding out more about my options trading mentoring program. If you would like the opportunity to “meet me online” and have a chat please enter your details on the contact me page and hit “Submit” now. I will get in touch within the next business day. To give you an idea of the quality of the course documentation provided with our options mentoring program, we are offering a sneak preview into Module 3. 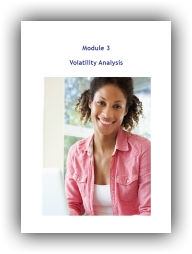 This module explains the impact that shifting volatility has on both bought and sold options’ premiums.